Changes are afoot at Google. A couple of weeks ago Google announced that it is refining its algorithms to minimize the impact of “Google Bombs.” (It’s curious that they made a big announcement rather than just doing it covertly, but perhaps this way they get to control how the news is framed.) Apparently, link text will be weighted less heavily in determining relevance to search terms. Presumably this means the page content will get more weight — ultimately there are only a few parameters that can serve as inputs in PageRank. 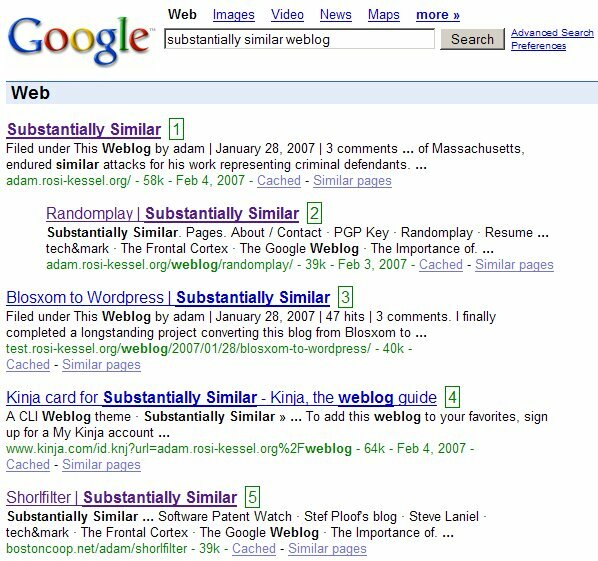 I am fairly certain no one has created a link to me yet with the link text “substantially similar,” yet I’m already the top result. 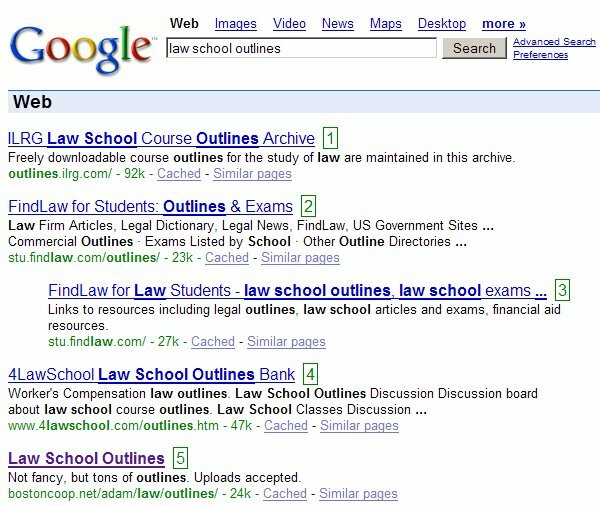 That last link above is my old law school outline site — and the text “not fancy, but tons of outlines” doesn’t appear anywhere on the page itself. Instead, it is a description of the site from a couple of outline “portal” pages. Actually, that description is contained within the source for the page in a META tag. I guess the portal pages get it from the same place. Chris: I’m not sure what you are referring to. There are no META tags in the source code to my outlines site, nor does the word “fancy” appear anywhere there. Oh, sorry, I was looking at the wrong link. You’re right, and that is a bit strange indeed. And now I must link to you because you said no one has.